For those of us who live with gray skies winters and lots of rain instead of blue skies, snow and sun, or better yet, the warmth and sun of tropical locations, may experience S.A.D. and/or full blown depression and everything in between that makes us feel not so great. I resisted purchasing light therapy for years! However, as last winter was my worst winter on Vancouver Island since 1999, it had me saying this year, “enough!” No more suffering through the fall and winter. The other day after being spurred on by a SAD Light Twitter Conversation with some online pals, I decided that very moment to go out and to finally purchase one; a S.A.D. light. 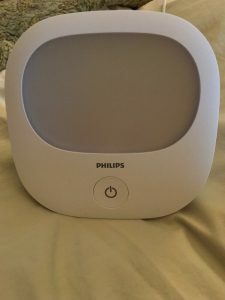 There may be better light therapy products out there and there certainly are bigger ones, but for me, for many reasons, this one is perfect for my needs. Did it work? Does it work? Or is it all hype? Some may not believe me, but being the super-hypersensitive person that I am, I felt the effects immediately! On day one, I was literally running around doing my tasks first thing in the morning. My mood definitely was right away better and I had higher and more sustained energy levels throughout the day without a doubt. Day One. So far this has continued each and every day that I use it; improved physical energy, ability to complete (physical and mental) tasks better, improved mood, and I mentally and emotionally just feel BETTER. First thing I do when I wake up is I turn on the light, still while in bed; and guess what? In no time, you don’t want to stay in bed! Up and at ’em! Time to get moving! Then I bring it into the kitchen with me and put the light on again while I make my morning greens, mixed berries and protein smoothie in the blender. If this trend continues, I’ll be able to breeze through the gray skies Island winter this year, energized! Fingers crossed.